Getting a cold it sounds like very common problem which should be faced by many people but we can make sure that many of them just want to be free from this suffering if it is possible. There is no question that the experience with sneezing, runny nose, sore throat, and congestion can be very uncomfortable. The symptoms of cold can be varied including fever and headache. 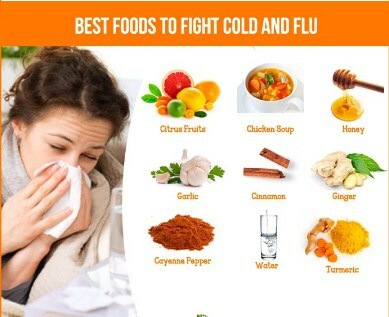 People just want to go to the doctor to get the medication but in fact there are some foods which can be very useful for combating the common cold. These are cold combat foods which will help people to regain their immune system so they can be free from cold sooner. Sardines are included as fatty fish and they are very rich in omega 3 fats. It is type of fat which is useful for reducing the heart disease risk as well as inflammation in the body. It is also possible that omega 3 fats can help people boosting their immune system since the immune cells functioning if enhanced. People maybe have ever heard that omega 3 fat can be found in other fishes such as tuna, salmon, and rainbow trout but it can be surprising that sardines actually comes with higher amount of omega 3 fats compared to those fishes. People must not forget that it also comes with other essential nutrients for keeping the immune system strong. Once people get sick, they will try to get more vitamin C intake. It means that people should look for the best vitamin C source and yellow bell pepper can be the answer. Vitamin C can be useful for helping people relieving the symptoms of cold. By taking vitamin C regularly, people can shorten the duration of common cold. The severity of the symptom can be lessened as well. Children, athletes, chronic smokers, and elderly can get immunity system boost with intake of vitamin C.
If people want to be free from cold, they should eat mushroom which is not only rich in B vitamins but also selenium and antioxidants. That is why this ingredient is considered as food which can boost the immune system. Antiviral effects can be found from mushrooms so consuming it can increase the cells which are useful for fighting the infections. People can prevent the development of advanced flu symptoms by taking more selenium. Immune system can be kept strong by consuming B vitamins which can be found in mushroom.